Tarmac Restoration Quotes. Fast online paving quotes. We can provide you with competitive tarmac restoration quotations from our database of authorised paving installation companies around the UK. 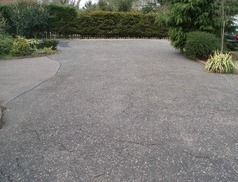 Whether you are looking to renew your tarmac driveway, footpath, playground or car park, this service is completely FREE. 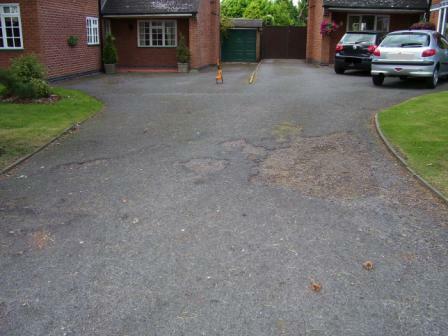 With use and the effect of the sun, the surface of a tarmac driveway will deteriorate and fade over time. Natural resins in tarmac tend to dry out which makes the surface more brittle, allowing cracks to form. But if the surface of your tarmac driveway or footpath is relatively sound, without severe cracks or pot holes it can be restored back to a more attractive and consistent colour. 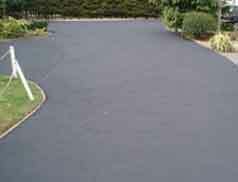 Tarmac restoration products are referred to as tarmac paint, tarmac restorer or tarmac sealer. And although they will reduce weed growth and offer some protection for the tarmac surface, for many householders the main benefit is aesthetic. The best performing tarmac restoration products are not available for general purchase by the public and so naturally the best results are achieved by employing specialist companies. For some weathered tarmac driveways, Tarmaseal™ can be a substitute for re-surfacing but before it can be applied, proper preparation of the existing tarmac surface is essential. The driveway should be thoroughly cleaned and treated with a fungicidal wash so that all traces of moss, weeds and algae are removed. Any cracks in the tarmac should be sealed with bitumen paint and small pot holes filled with tarmacadam wearing course. Tarmaseal™ is applied with a roller and it soaks into the tarmac surface replacing lost resins to make the surface water resistant. Tarmac Restoration or Tarmac Resurfacing? Restoration of a tarmac driveway may be no substitute for resurfacing. 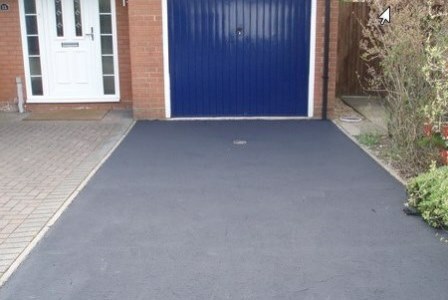 If a tarmac driveway or footpath is too badly damaged for restoration to be a viable option then it will either need resurfacing or a completely new tarmacadam driveway installed. Tarmac restorer will be inadequate if a resurface is required and a resurface will be a waste of money in the long term if a completely new tarmac driveway installation is the right option. The tarmacadam installers we work with can offer advice and quotations for all options. Thoroughly cleaning the tarmac and treating it with a fungicidal wash so that all traces of moss, weeds and algae are removed. Sealing all cracks in the tarmac surface with bitumen paint and filling small pot holes with bitmac wearing course. 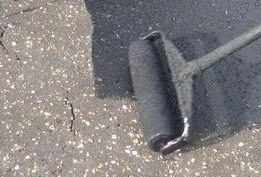 Applying Tarmaseal™ with a roller. It soaks into the tarmac surface replacing lost resins to make the surface water resistant. Compacting a 30 mm thick layer of new bitmac over the old tarmac. Laying and compacting 30 mm of new bitmac wearing course with 6 mm aggregate. 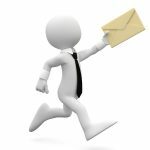 If you are intending to stay in your home for some time it makes no sense to cut corners but if a quick fix is required then choosing a cheaper option may the right thing for you. However, which option you choose ought to be determined by the condition of your existing driveway and if it has already been resurfaced. Building Regulations require that the surface of a driveway is at least 150 mm below the damp proof membrane and new houses are constructed exactly that way. Obviously a 30 mm resurface of an existing tarmac driveway will raise its level by that amount. 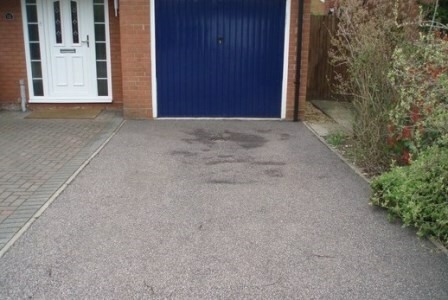 If a tarmac driveway is resurfaced several times, there is a real risk of a damp problem where the driveway meets the external walls of your home. Moss and algae tends to form on driveways which remain wet for a long period of time, such as below overhanging trees. This should be cleaned off regularly as part of a householder’s general maintenance otherwise the driveway will become slippery. 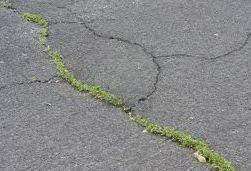 As for weeds, on a well-constructed tarmac driveway, weeds are more likely to grow in cracks rather than sprout from the ground below the sub-base. Householders should remove the weeds, apply weed killer and tap the tarmac down along the line of the crack. The inherent flexibility of the resin rich, oil-based bitumen which binds the aggregate together may result in the surface bonding together if only minor damage has occurred. 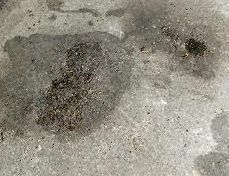 Light oils such as diesel or petrol can damage the surface of a tarmac driveway and once damaged it cannot be invisibly repaired. The only solution is to cut out the affected area and repair it in the same way as a pot hole. Unfortunately the darker patch of new tarmac will remain obvious unless the whole driveway is resurfaced or replaced.